The brilliant colors won't last too much longer but I'm going to keep on showing it til it's gone! If you show it, we will admire it. 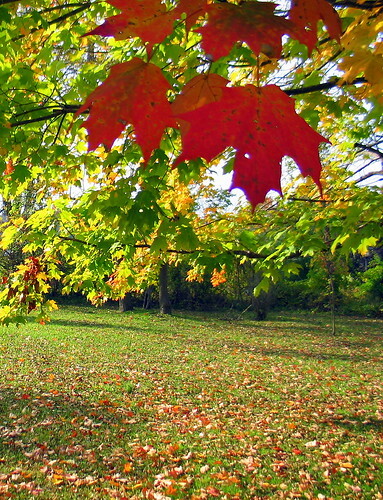 I love these pictures of the fall. Keep track of those colors for us please. Simply Beautiful, thanks for sharing this with us. Yesterday you said no more pretty colours. Too soon. What synchronicity! As I first looked at, I thought exactly the same as you had written, but before I read it. So it must be the right thing to do. You see? Sometimes it's so easy to take a decision! :) You have this all around you, some of us have nothing like it, so it's another service, nay, a duty! Too beautiful not to. This is something living in a city lacks. Thank you for bringing automne to us here in Paris too! Don't worry... my maple out the window has just sprung into life and is looking superb ! I'll enjoy the sunshine for you!